The following text is from a presentation at the 2018 Digital Initiatives Symposium, hosted by the University of San Diego. The full text can be seen at http://bit.ly/DIS18_DSSG. Greetings, and thank you to the organizers of the 2018 Digital Initiatives Symposium for the opportunity to speak today about challenges related to supporting and facilitating digital scholarship initiatives at Harvard, and about the success story in the making that is the Digital Scholarship Support Group. Let’s begin with the problem. The proliferation of digital tools and methods in higher education – teaching, learning, and research – has created an increased need for access, training, support, and infrastructure. Not all colleges and universities have formal organizations or infrastructure dedicated to this purpose, and while Digital Humanities Centers and Centers for Digital Scholarship are popping up all over the country, far more institutions still lack these hubs than actually possess them. Many organizations at Harvard touch on topics that are connected to digital scholarship. Among these are Academic Technology for the Faculty of Arts and Sciences, Research Computing for the Arts and Humanities, over 70 Libraries, Library Technology Services (which is part of Harvard IT rather than of the Library proper), the Digital History Program, the Institute for Quantitative Social Sciences, the Harvard Library’s Maps, Media, Data, and Government Information organization, the Center for Hellenic Studies, the Fairbank Center for Chinese Studies, the Center for Geographic Analysis, the Derek Bok Center for Teaching and Learning, et cetera, et cetera, et cetera. Add to this the fact that some of these organizations (and countless more not listed here) are responsible for the elephant’s trunk, some for the feet, and some for the diet, hide, or cardiovascular system, while many more are responsible for their very own elephants, and the overall picture’s lack of clarity becomes a bit more clear. When it comes down to it, an effort to figure out how this system should be navigated by a scholar or student trying to conduct (let alone learn from scratch about) digital scholarship can be difficult. This is not a unique situation, but it does serve to exacerbate an existing problem at as distributed a research university as Harvard – and it makes behind-the-scenes coordination between supporting organizations absolutely critical. So how did we begin to address this? This isn’t a challenge that we’ve solved by any means. Over that time, our effort has grown from two individuals, and the remarkably capable members of our respective teams, to a remarkably effective network, but we had to start small, taking advantage of a specific impetus to begin chipping away at the problem. That impetus was the Digital Teaching Fellow, or “DiTF,” program. The DiTF program pairs faculty and graduate students for the purpose of supporting the use of digital methods to enable flexible, active learning approaches in the classroom. As it began to expand beyond the History department, there was a need for support and structure. 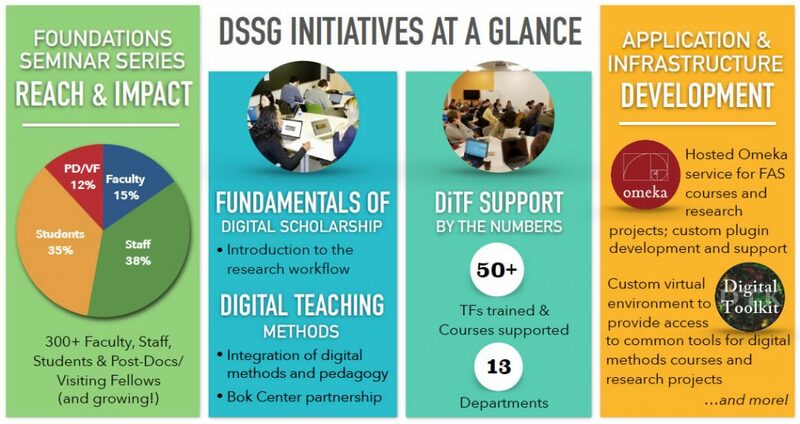 In October 2015, I and the faculty member leading that program, digital historian Gabriel Pizzorno, got together to begin mapping out what that would look like, beginning with introducing the incoming wave of DiTFs to digital tools and methods for their courses. Next, we had to figure out the next level of needs, and what we could – and should ­– do to address them. Using computation & digital tools to ask new questions and find answers in ways that would not be possible without these approaches. Using digital tools to communicate/disseminate research in new and different ways, and/or to accelerate/broaden the impact of research. Interrogating [born] digital sources with humanistic methods. When it comes down to it, research is research, whether it’s digital or analog: you still have to isolate your question, gather your data, test your hypotheses, and then present What It All Means. In this scenario, then, ‘digital scholarship’ is using computational or other digital methods and tools in any or all phases of coming up with new questions, interrogating data, and presenting the results. Now, you may notice we didn’t differentiate here in writing between “scholarship” and “teaching.” That’s not an intentional omission, but it’s also not entirely by mistake: integrating digital methods and tools into teaching and learning, from assignments to presentation to projects, doesn’t necessarily meet an immediate research goal, but it does at very least provide familiarization with tools that do serve that digital scholarship mission. The exposure to digital scholarship that graduate students gain through their participation in the DiTF program, for example, can lead to the exploration and adoption of digital methods in their research. This benefit can also reach faculty, who can build on this initial exposure to continue exploring ways to incorporate them into their research and teaching. The Digital Scholarship Support Group brings together Harvard faculty and staff with expertise in a host of technical, pedagogical, and subject-specific areas across disciplinary and divisional borders, to provide faculty, students, and staff interested in incorporating digital methods into their teaching and research with a single point of entry to the many resources available at Harvard. Developing well-integrated, University-supported infrastructure and the in-house expertise essential to sustain digital scholarship at Harvard. The bedrock of our digital literacy initiative is a Foundations Seminar Series consisting of two semi-annual hands-on workshops. The first, ‘Fundamentals of Digital Scholarship,’ introduces participants to the digital research workflow, from data acquisition through cleaning, manipulation, and visualization, to final publication. The second, ‘Digital Teaching Methods,’ focuses on the thoughtful integration of digital tools and methods into pedagogy, with a focus on backward design and the most effective achievement learning goals. We partner on this with the aforementioned Bok Center for Teaching and Learning, which helps provide consistent pedagogical guidance to faculty and graduate teaching fellows alike. Application and infrastructure development projects, led by Academic Technology’s Tools and Development group, have included the creation and support of a hosted Omeka service and of a virtual environment (or ‘digital toolkit’) that allows students and researchers to access commonly–used digital tools in a stable and preconfigured platform. What began three years ago with two of us – representing the History Department and Academic Technology for the FAS – has grown to include, and to depend on, key representatives of Arts and Humanities Research Computing, the Harvard Library, and, most recently, the Institute for Quantitative Social Sciences. This core group, or Standing Committee, meets biweekly and beyond to maintain this effort, despite it not technically being anybody’s primary job to be a part of the Digital Scholarship Support Group. We’ve also evolved an “affiliates” group, comprised of key individuals and organizations who interact with the DSSG and its activities on a less regular, but no less valued, basis. Finally, we’re addressing the need for scalability by recruiting an Advisory Board comprised of faculty and senior administrative staff, which will help the group to focus resources, support, attention, and more where they’re most needed. This is still the beginning, but it’s a success story in the making that has made a significant and measurable impact on digital scholarship at Harvard. We hope to continue building on this, working across our own organizations and with other Universities to promote, support, and further develop digital scholarship at our institution and overall. Thank you very much for your time, your attention, and (in advance) for your feedback! The DSSG Standing Committee currently consists of Gabriel Pizzorno (Preceptor on History, Department of History; DSSG co–founder and inaugural faculty chair); Jeff Emanuel (Associate Director of Academic Technology, Harvard University IT and Faculty of Arts & Sciences; CHS Fellow in Aegean Archaeology & Prehistory, Center for Hellenic Studies; DSSG co–founder); Marty Schreiner (Librarian, Lamont Library; Head of Maps, Media, Data, and Government Information, Harvard Library; inaugural DSSG staff chair); Rashmi Singhal (Interim Director, Arts & Humanities Research Computing); Simo Goshev (Manager of Data Science Services, Institute for Quantitative Social Sciences); Brandon Bentley (Senior Instructional Technologist, Academic Technology for FAS); Kathi Matsuura (Japan Digital Scholarship Librarian, Fung Library); Hugh Truslow (Head of Social Sciences and Visualization, Maps, Media, Data, and Government Information, Harvard Library); Cole Crawford (Humanities Research Computing Specialist, Arts & Humanities Research Computing); Jeremy Guillette (Digital Scholarship Facilitator, Department of History); Bill Barthelmy (Senior Technical Architect, Academic Technology for FAS). The primary development work was carried out by Arthur Barrett, senior software engineer for Academic Technology Tools & Development, with support from AT–T&D associate director Michael Hilborn and members of the DSSG Standing Committee.